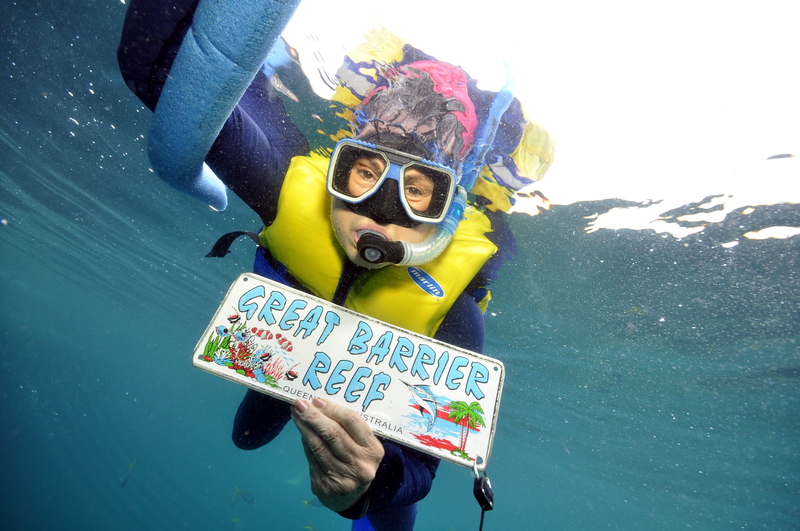 I fell in love at the Great Barrier Reef. It was love at first sight. My third visit to the Great Barrier Reef paid off as it was the best. His name is Wally and he was so ugly he was cute. Wally has such a sweet personality and was so easy and good with people. I got to hug Wally and touch and rub Wally and it was absolutely awesome. 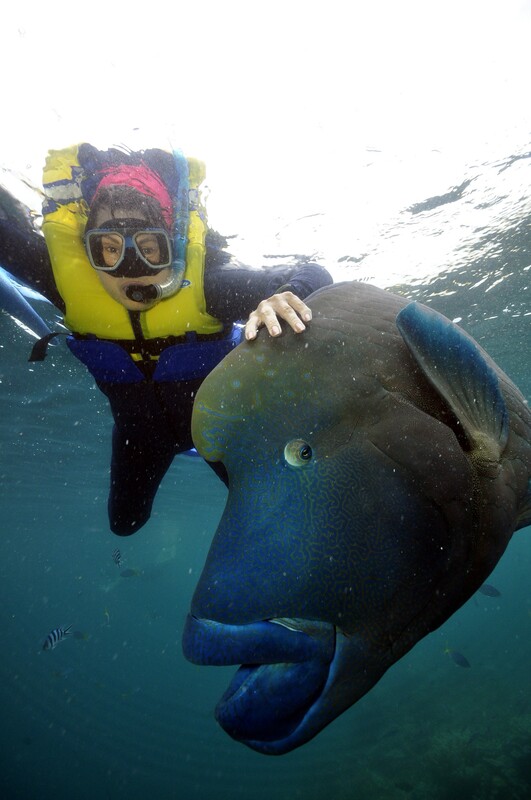 Wally is a Hump Headed Maori Wrasse, about 5 feet long and he is a fish! On this visit to the Reef, I decided to take a guide with me around the Reef to explain what I was seeing and the names of each fish. Amy was a precious size 2 lady marine biologist who took me and 2 other ladies on the reef adventure. She explained every fish we saw and there were polka dot fish and zebra-looking fish and multi-colored fish and every other color combo fish you can name. But there was none like Wally. He was bright blue with dull lime green color on his back and tail. It felt so good to touch Wally because he was soft and slippery and smooth. One time, I rubbed his big eye which looked like it was a marble just stuck on the side of his head. He closed it as I ran my hand passed one eye, then, he opened it up again. Wally’s head was somewhat like a horse’s head in that it was a long way from his eyes to his mouth. And what a huge mouth and lips he had. His lips stuck out from his mouth. He would just swim around on his own schedule and the underwater photographer that I had to take my photo had to wait until Wally decided to get close to me. He just swam slowly around the platform where we docked at the Reef from 10:30am-3:30pm. 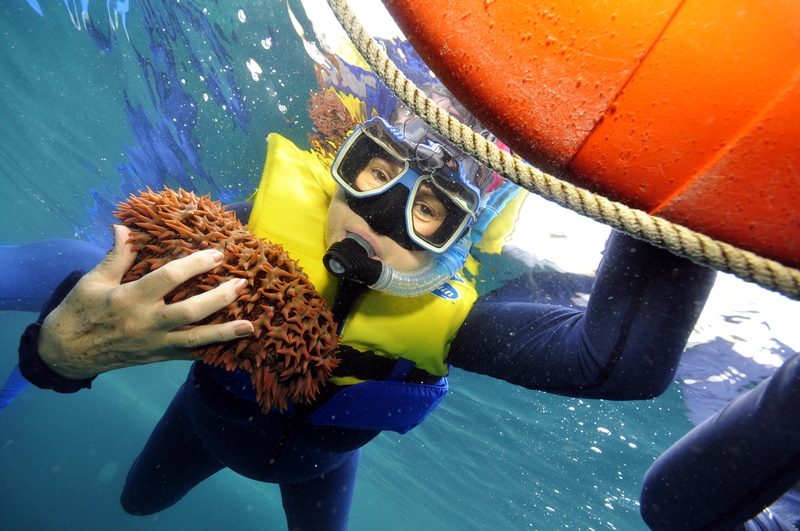 Before Wally arrived, I had my photo taken underwater with a sea cucumber! It was alive, about 12 inches long, orangish-red in color and was covered with1 inch protruding points that were soft and did not hurt my hands. The cucumber was slick and slimy but it was easy to handle and I never saw its face or mouth. I had to ask Amy if it was real and she said yes because it was just on the corals. The finale was the feeding of the fish from the Reef Magic platform. And you guessed it. Wally was right in the middle of the 1000’s of fish that had gathered making sure he got his afternoon snack. I was in the water right beside Wally as he caught the 1:15 pm fish pieces. It was just an outstanding experience to be among so many different colorful varieties of fish as they ate their fish pieces. I attempted to catch others but they were so fast and looked so close but they were not. Plus, I knew many of the fish had sharp razor-like fins. Of all the fish, Wally was the biggest that we saw on the corals. The others all looked like the beautiful colorful fish in a fish tank. How the fish on the Great Barrier Reef knew it was 1:15 pm and time for their snack, I will never know. I felt it was just a joy and honor to be there while they ate. At the Reef World platform in the Great Barrier Reef, we saw the reef in a glass bottom boat and went about 12 inches above the corals. The views were spectacular and we surveyed the 400 varieties of corals and the 2,000 species of fish in the 1600 nautical mile Great Barrier Reef, which is composed of 2,904 reefs. Then we went on the submarine to see the reef and that was interesting because we saw the reef system like I was scuba diving. A helicopter was available to take anyone on a total view of the Reef and I was able to see a large section of the Reef from the air. But I just went underwater to see the reef and be with Wally. At the Reef, I saw butterfly fish, parrot fish, rainbow parrot fish, clown fish (Nemo), several variations of the wrasse family of fish and the Hump Headed Maori Wrasse (WALLY). Plus, I went through a school of millions of 2-inch long silver fish and it was an incredible experience to have them surround you 360 degrees. But before I left, I had to tell Wally “Goodbye” and hug him for making my visit at the Great Barrier Reef the most wonderful snorkel experience in the world’s #1 reef system. I got to pet Wally, too in March 2005. I think it’s the same fish. He was about 40 years old then and was rescued after a fisherman caught him and almost shipped him to Hong Kong. Same guy?